Today we are going to be taking a look at a new fan from Noctua. Most users will remember Noctua due to their color choice on their fans. 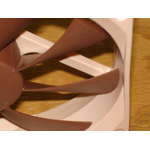 Noctua has stuck with the same color selection while producing another unique fan blade design. We will see how the NF-P12 compares to the original NF-S12 as well as a Coolink SWiF 1202.